Such a gloomy racing weekend just gone. Bad news at every twist and turn. 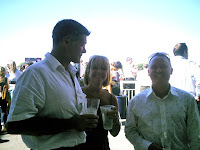 So I’m grateful to my mate GC who has unearthed some photos from a day at the races back in 2007. They have momentarily punched a hole in the gloaming with sweet memories of a rather splendid, perfectly executed, borderline classy trip to Royal Windsor Racecourse one fine August day. 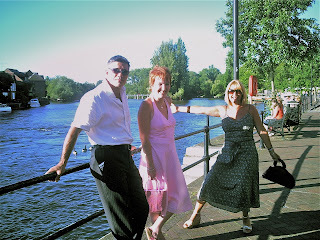 Looking at the photos - GC, Bex, Mrs A and me all sparkly and bright in our smart-casual - I’m struck by the weather. Those azure skies, dazzling whites and lush greens just serve to emphasise the February murk I’m peering through from the window of my shed (I mean summerhouse) (I mean office) weighing down on and maybe even suppressing the spirit within. (Yes, I’m reading Jude the Obscure again). Photos can be deceptive. As I recall, 2007 was a pretty miserable Summer. Indeed GC remarked to us, sipping a pre-race Pimms and fruit salad creation (and doing remarkably well to avoid poking himself in the eye with a sharp straw), “The wettest, coldest August in a generation and we organise perfect high summer weather for one day only? How does that happen then?” He was right. I composed a smug grin, the effect of which was only slightly tarnished by stringy pineapple bits and strawberry pips wedged in my teeth, left over from my own pimms & fruit punch encounter. I may be over-emphasising on the literal detail of the summer cocktails here. But you catch the mood, I suspect. Indeed that mood had been perfectly cast the moment we left for the track. No-one wanted to drive with those alcoholic fruit salads in prospect, and Silverlinking (RIP) our way to Windsor and Eton Riverside BR was always too convoluted for comfort. So the taxi alternative was an easy decision. But Mrs A and I were certainly not expecting the shiny Mercedes-Benz S class parked outside Bex and GC’s place, nor the grey suited, peak capped, leather gloved driver holding open the doors for us. This was no mere taxi. This was a chauffeured limousine! Turns out GC and Bex knew Rob the driver and had asked for the full works. And that is precisely what we got. Apart from a couple of moments anxiety, trapped in the never ending, budget spiralling M25 road-widening works, we breezed over to Berkshire. The highlight of the journey, I recall vividly, was being waved through the barrier by dayglo-jacket man as he peered through the windows of our Merc to see which celebs were being chauffered in. We pulled up hard against the main entrance whilst the poor mugs in the hail-a-ride jalopies behind were tipped out at the barrier. I swear Mrs A crafted a regal twist of a gloved hand for the crowds as we cruised through. 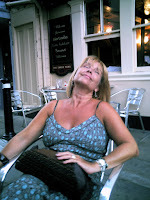 The champagne cocktails and pimms frivolities didn’t last long. Guinness (always my real-ale stand by), red and white wine were soon flowing faster than the adjacent Thames. Normal service resumed. Winsdor has surprisingly few weekend fixtures. Most of its meetings are shoehorned into the increasingly popular end-of-work to end-of-daylight slots during Summer evenings. So it felt like the locals had made the effort to capitalise on this gorgeous day by turning out both in force and éclat. There was enough exotic headgear to put the pimms fruit salads in the shade. Nice to see Mrs A and Bex easily surpassing the standard, though. Blimey, they scrub up well (given a clear brief and sufficient lead in time, that is…)! It wasn’t a day for serious punting. The four of us ponced around the paddock (or was that just me? ), schmoozed through the bars, lingered by the running rail and joked with the oompah band….generally soaking up the vibes and bantering the day away. The racing was a good enough middle-ranking mix of handicaps and maidens, with one conditions sprint chucked in for a nod to quality. My nap for that race, Galeota came a fairish 2nd (and went on to win three times in the remainder of the season unburdened of my cash on each occasion). It was his first outing for 2 years having failed at stud after shooting jaffas! I didn’t get any closer with the straight bets, but I didn’t half give the placepot a scare. Smirfy’s Gold needed to make the frame to land me what I suspected would be a decent dividend. He was fast out of the blocks and gave me a real thrill before fading out of the places in the final furlong. A frameless 4th. The divi was £146 to a £1 stake. I had a wringing wet two-quid ticket welded to my sweaty little palm. A very, very, near miss. GC had much better luck. We crossed to the far side of the track for the feature handicap. Nice perspective from there back to the packed stands. We watched the field flash past us at close quarters, to collective groans as we racked up more losers. But no, not collective. GC was grinning like a Cheshire cat! He’d only bagged the 12-1 winner, Muhannak! Where had that come from? Fantastic! 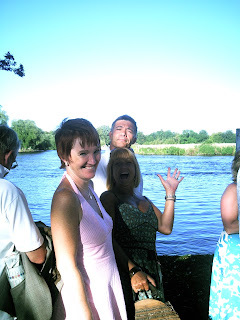 After racing, we joined most of the other punters on the very pleasant boat trip back up the Thames to the town centre, passing giant riverside spreads with cruisers privately moored at the bottom of manicured grounds. The refined residents must have loved the bawdy and full throttle racket emanating from these ferries lurching their way upstream. 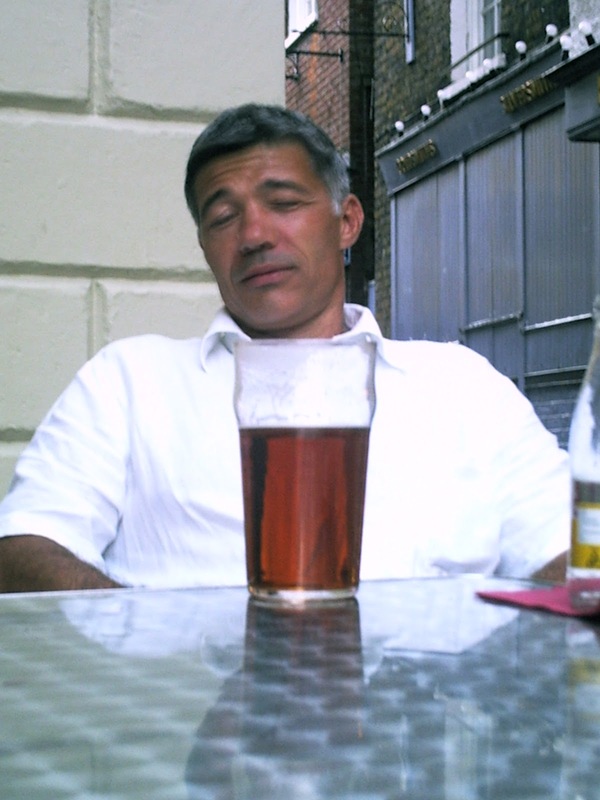 After troughing heartily we inexplicably concluded that another drink was needed. Of course! We’d only been on the sauce for about six hours! I remember winding up Castle Hill and stopping to tell Bex, GC and Mrs A about a waggamama restaurant that used to be a kebab house. I lamented the fine, hand-crafted produce that this place used to purvey. Last time me and the lads were here, Bryn had a unique thing called a kebab roll. I’d never seen anything like it before….a flat bread and kebab meat creation with no salad. Fascinating. I turned round from staring in disgust at the new restaurant to find myself alone! Bereft! Those bloody fast-food philistines had high-tailed it off to the Horse and Groom. I soon caught up. It got dark soon after and my recollection gets hazy. But I do remember GC flicking open his phone, saying something like “Beam us up Rob” and miraculously the Merc appeared right there, right then to teleport us home. Fan-bloody-tastic. I still don’t know how he did it. 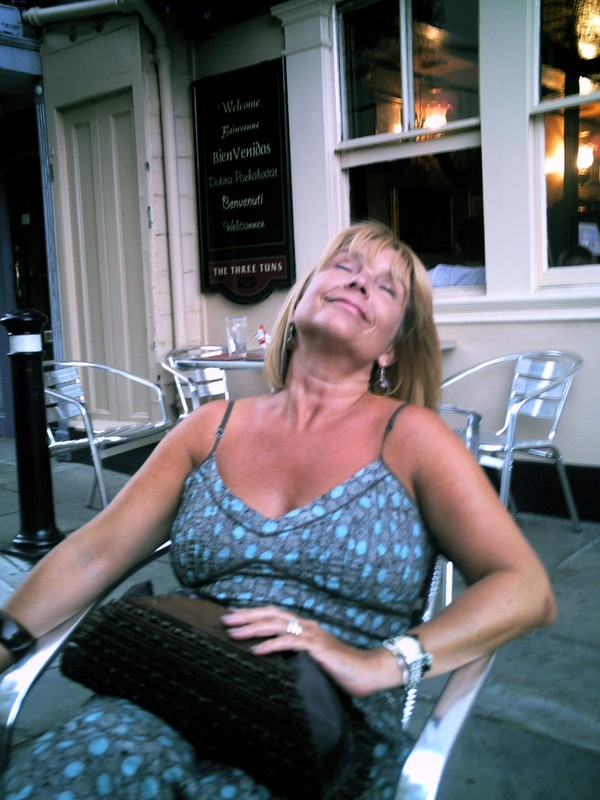 And then, we staggered out of the car straight into The Lamb, round the corner from our house. I don’t know why. 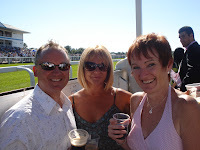 I sort of recall the four of us lording it over the place, telling anyone who would listen that we’d had a top day at the races but that we’d only had one miserable winner to share between us. I also remember trying to square the debts of the day with GC at the bar. “Two tickets for the races equals half a cab fare plus a quarter of the dinner. I’ll see you and raise you.” We were in no fit state for such high finance. GC, mate, I still don’t know if I ever properly settled this one….. 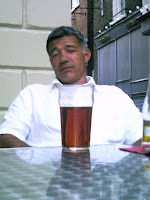 The last photos present circumstantial evidence that we ended up at ours, sinking into oblivion in the wee small hours. Probably. A fitting end to a very smart day out.